This past June, Winooski artist Leslie Fry invited the public to to see the largest sculpture she's every made. Forget white walls or blue-chip chatter — Fry's masterpiece was mostly in gray, white and a lot of green. And instead of one work, it was a whole garden of them. Fry, who has lived in her Winooski home for more than two decades, started work on the current iteration of her sculpture garden in the summer and fall of 2014 while she remodeled her studio space, taking advantage of having excavators on hand. Seven Days' Ken Picard profiled Fry back in 2006. Today, though, the occasion is sordid. 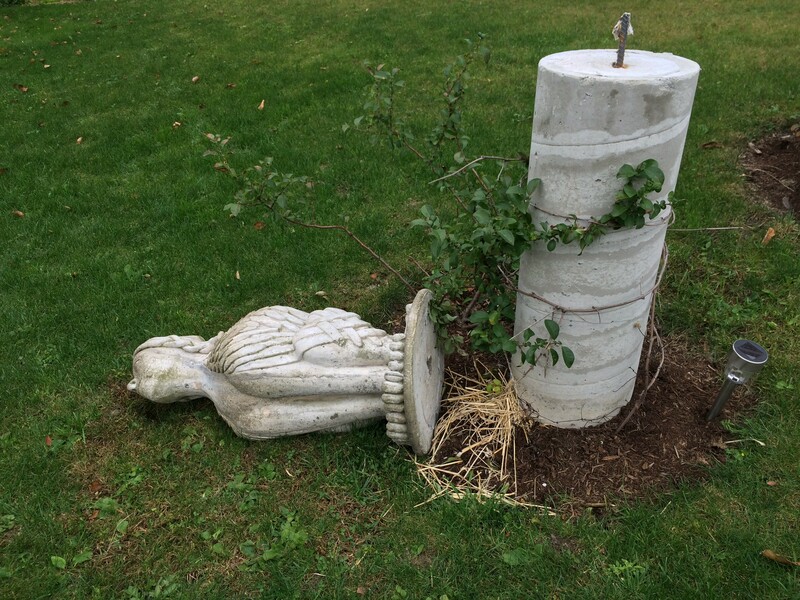 Someone has dislodged the two sphinxes that mark the entrance to her sculpture garden. Many area residents are familiar with these sphinxes — they are the siblings of the gargoyle-like figures installed in Shelburne Road's Pomerleau Park, a city commission that Fry completed in 1999. “There's reasons it's creepy,” Fry says. She was out of town during the act of vandalism, but her downstairs tenants alerted her when they encountered the damage, which occurred sometime between Sunday evening and early Monday morning. She explains that each sphinx weighs approximately 300 pounds and is affixed with a rebar pole to a cement column that goes down six feet into the ground. 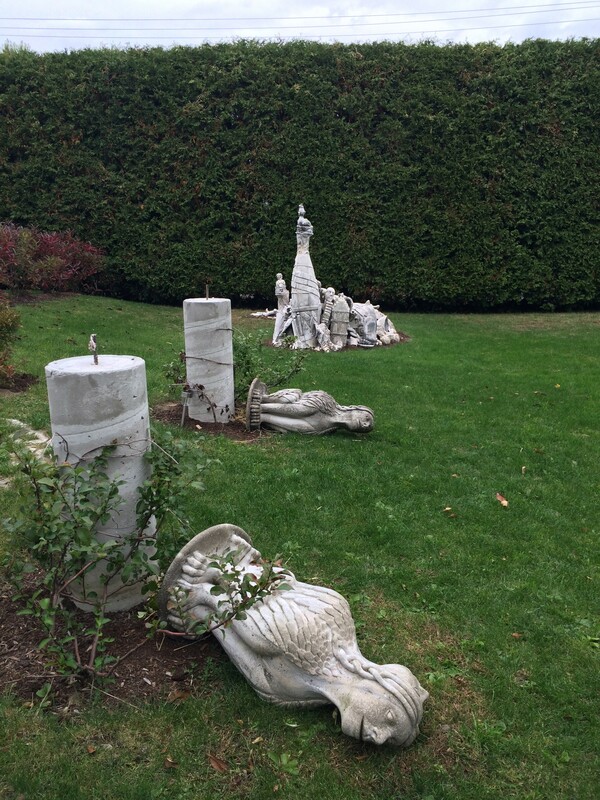 During her initial installation, she further stabilized each statue using an epoxy grout. “It couldn't just be one person spontaneously,” she says, standing over the fallen sphinxes. 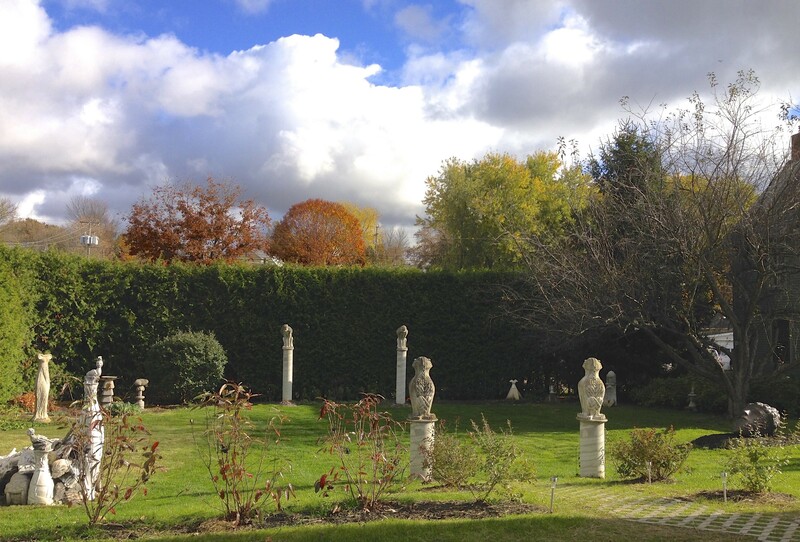 No other works in the garden were tampered with, and nothing was stolen, but two young crab apple trees in the front yard were cut at their base. "Pining," a sculpture that was decapitated in Seminole, Fla.
For better or worse, Fry is not a total stranger to having her art defaced. 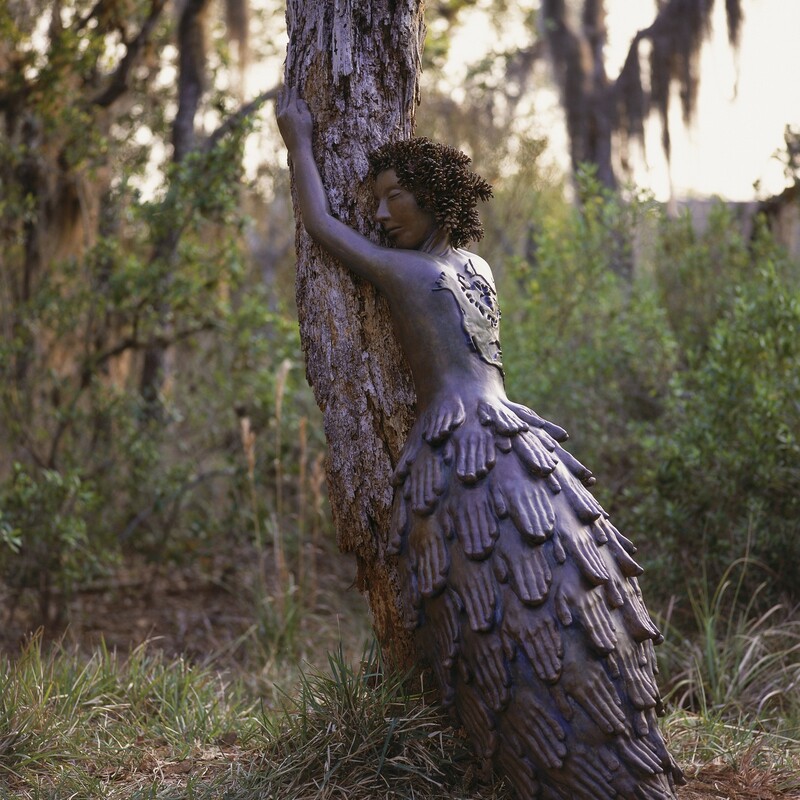 In 2007, she completed a commission in Seminole, Fla., of life-size plaster figures lining a wilderness nature path. She finished getting each piece just right, and that evening three of the humanlike sculptures were decapitated. She fixed them, and they were decapitated again. She fixed them once more, but again they were decapitated. After the third time, she continued to lead her artist-in-residence tours but left the works headless. She adds that her creatures at Pomerleau Park have not been attacked, but they have been accessorized. “The things that were done to it were almost affectionate,” she says of the newspaper hats and Groucho Marx glasses that cropped up. Fry has been a resident of Winooski since her University of Vermont days, and she just donated a wall sculpture to Winooski City Hall. “I'm a huge Winooski booster,” says Fry. 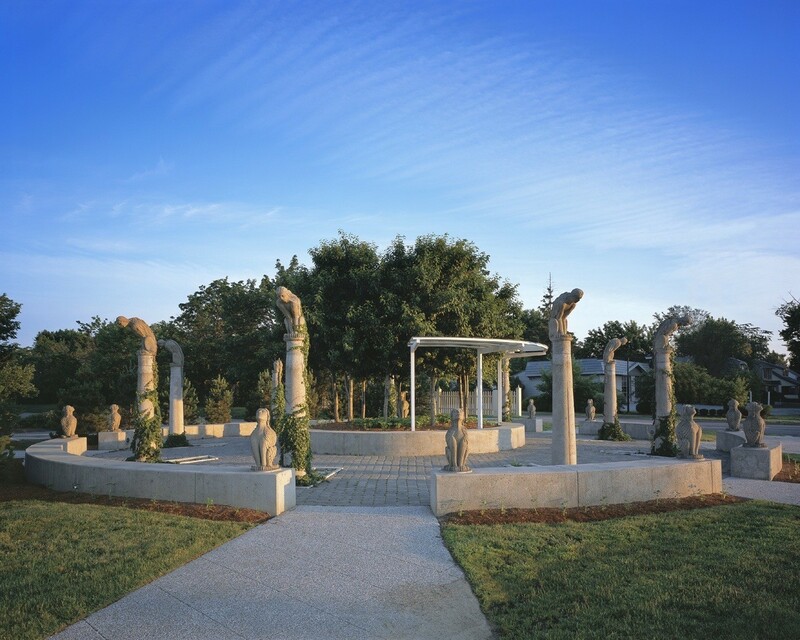 “I don't want to think ill of being here.” When asked if she has plans to make her garden public, she says, "Maybe in 10 years from now when it's more solidified, it could be a place where [the public] is welcome. Now it feels not as safe, but it is in the back of my mind." As far as recovery goes, she plans to plant new trees and restore the sphinxes to their proper place as soon as possible. In regards to the latter, she says, "I could use two strong guys." If you'd like to offer a hand or have any information about the incident, please email lfry@lesliefry.com.